The world has rejected Jesus Christ, but believers have come to him for salvation and continue to come to him in order to grow in that salvation. “Come” is in the present tense which indicates the believer continues to “come” to Christ, who is “the living Stone.” But, as if to warn the believer pursuing growth, Peter inserts the comment that this Christ was “rejected by man” and most likely will continue to be rejected even by believers after they have accepted him as savior. A continuation in coming to Christ means the believer, who is already saved, will begin to be built into a spiritual house. This spiritual building is a temple made up of believers who are maturing as they “Are being built” is not an imperative that commands the believer, but a principle that occurs when they continue to come to Christ. By continually coming to Christ the believer will become part of this spiritual construction that will produce activities and works that are acceptable to God. Neder (Hb) - Vow (Eng) - neder is a Hebrew noun that comes from the verb nadar that means "to vow" and "to dedicate." In the Bible a neder is a promise to either do something or to not do something. Do I continue to come to Christ for growth, or am I also replacing the rejected Stone with acceptable religious lingo and appropriate social behavior that causes conformity instead of growth. Just as I came to the Rock of Truth for salvation, I will continue to come to the Rock of Truth for spiritual nutrition and growth. The two inch set back on each course of herodian ashlar stones can be seen as it rises in this photo of the southwest corner of the Temple Mount retaining wall left standing in 70 AD. The remains in the bottom left corner are steps that led up over the roof of the first century shops that can still be seen along this west wall. 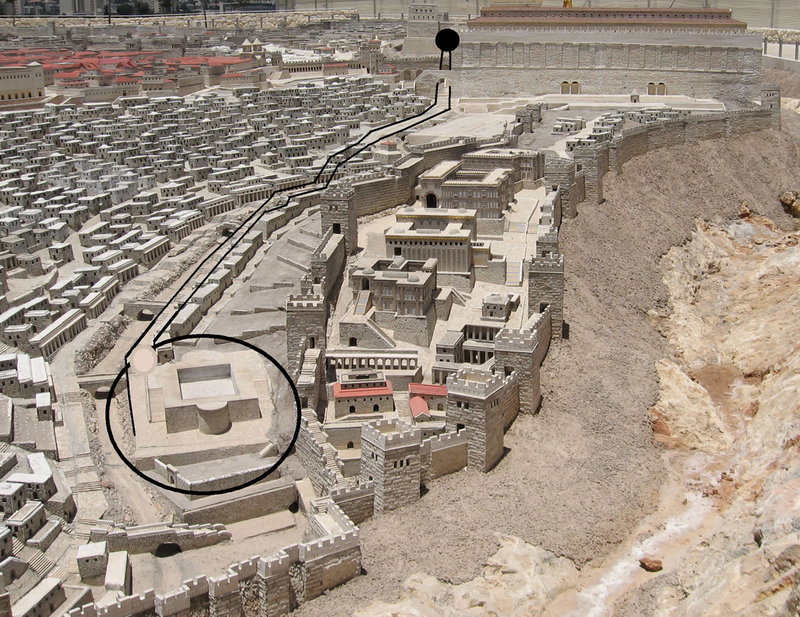 Details of the Pool of Siloam and the road that connected the Pool of Siloam in the south with the road along the Western Wall of the Temple Mount. "The culture doesn't dictate truth; the gospel dictates truth." "Folly delights a man who lacks judgment, but a man of understanding keeps a straight course." Your purpose and motivation are clarified during times of challenge and confusion. Press on!